If you’re planning an event on the Northern NSW coast, we would be honoured to provide all your Tweed Coast Photobooth hire needs. The Tweed is a hidden gem, stretching from Tweed Heads in Northern New South Wales down to Byron Bay and beyond in the south. There are so many picturesque venues and settings to hold your special event! From a photo booth at a Byron wedding to a school formal in Murwillumbah, we have the experience and expertise to ensure your party guests remember yours as the greatest event ever! Brett and Sam are lucky. You may have met us on the Gold Coast, but we also get to look after Northern NSW photo booth hire as well. We love working in the venues around the coast and hinterland and often spend our own holidays in Byron and Brunswick Heads. As parents of two girls, we are busy with family life and photo booths, and love every event we attend. Such is the beauty, Brett’s parents will be retiring in Kingscliff! Another great reason for us to visit! Enquire Now to make your event in the Tweed or Byron Bay area a great success. Our photo booth will happily keep your guest laughing and entertained all night! "Aaron and I would like to thank you for providing a photobooth for our wedding in April. It was such a big hit with our guests! It was all set up ready to go when everyone arrived and your attendant on the night was great. He was so accommodating and helpful! Everyone had such fun and loved that they could take home a copy of their photos as well as stick some in the wonderful guest book you provided for us – which I love looking back on. The entire booking process was made effortless and your staff very helpful. We also loved the amount of designs we could choose from for our prints! Thanks again for helping to make our day what it was!" "I would like to say a huge THANK YOU to you and your staff. On any occasion that I rang your office, my questions were answered quickly, happily and nothing was too much trouble. At the venue, the attendant set up quickly, and with no fuss. The booth itself was roomy, easy to use, and so much fun and the photos we received were of the highest quality. Our poor booth attendant on the night was kept very busy but he remained both friendly and helpful and definitely looked the part. Emma and Ryan loved the finished product that you sent to them. Our family and guests all had a great time and many asked where you were from, and said how great the booth was. I certainly have no hesitation in recommending In The Booth to anyone who are thinking about hiring a photo booth. Again, thank you for making Emma and Ryan’s wedding even more perfect." 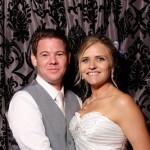 What is it you love about providing photo booth hire services in Northern New South Wales? The Tweed Coast and Byron Bay area is so special. Untouched. So getting to setup our photo booth in Byron Bay or exploring the hinterland around Mt Warning is always unique. The options are many and cover lots of little hideaway places. Tell us about some uniquely Northern NSW touches you have seen at an event? Venues like Figtree Restaurant, Mavis’ Kitchen and Byron Bay Surf Club all offer something a little different. Embrace the beach theme in Byron, celebrate a rustic chic event and pick your own herbs from the gardens at Mavis’ Kitchen, or hold a nostalgic vintage wedding at Figtree. We love the little touches that venues offer. 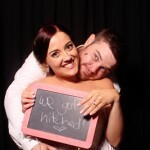 What is the most common question you get asked about photo booth hire in Northern New South Wales? Byron Bay photo booth hire guests commonly ask about the video option. It’s just part of our package, but the quality of the videos and being included in the price really sets us apart. A little trend I have seen is Brides and Grooms leaving a message for their ‘future selves’ on their wedding day! Let the photo booth take care of the fun memories! Most photos at Tweed weddings are staged. That’s okay, most need to be. But the fun really happens inside an enclosed photo booth. My tip is go to lots of wedding expos, get in as many booths as you can. I promise that if you find me at an expo, you will remember my booth! Visit the hideaway places. Tweed Heads, Cabarita, Kingscliff, Evans Heads, Brunswick Heads… I could visit all in a weekend and I love every one. Have lunch in Tumbulgum, Dinner in Lismore. Why not even spend your honeymoon in the area. Especially if you are a visitor. You may even stay!